The very first "Inspirational Infographic" I saw on the blog post was the "Die Hard Index." Apparently this was a student project, so I'll cut the creator of the viz a bit of slack, but @datavis should know better. While this is a "pretty" graphic, it is very difficult to gleam any insight. I just so happened to read Stephen Few's article "Our Irresistible Fascination with All Things Circular" in which he states "the primary goal of any data visualization is to inform, and that it should be carefully and knowledgably designed to support this goal based on the principles that we’ve learned through years of research about graphical perception." The problem with this visualization is that it takes too much work to find anything useful. 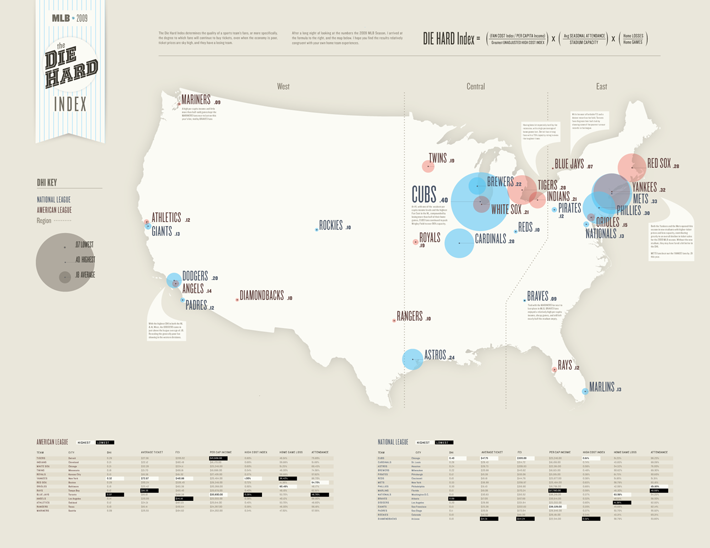 You have to look back and forth between the infographic and the legend. It's nearly impossible to compare the size of the circles. If you can do it, you're a genius. Compare the Phillies and the Cardinals. Can you tell the difference? The labels for the points are quite confusing. For example, look at the Cubs and White Sox. Which dot represents which circle? The creator is a student, however, the student needs to learn effective data visualization techniques. Hopefully the teacher has the knowledge and skill to provide adequate feedback, otherwise the student will fall into the deadly hands of all the other lovers of "pretty" infographics. Let's save them while we can. First off, I agree with your points about the infographic. It is not an effective way to communicate the data. We're on the same line here. Nevertheness, I posted the infographic on Tumblr purely for inspiration. I don't go into details or discussion about the readability, intuitiveness or effectiveness of the visualization method at hand. That's why I started the Tumblr account in the first place — to have a stream of inspirational infographics without the need to analyze every piece I post on there. This is also the difference between Datavisualization.ch and the We Love Datavis Tumblr. I appreciate the effort of discussing the effectiveness of a visualization and think that this helps designers rethink what they produce. This was just not the idea behind the post. Thanks for the comments Benjamin. In the future, whenever possible, I will identify the data used in these infographics and present a more insightful alternative. Keep up the good work.